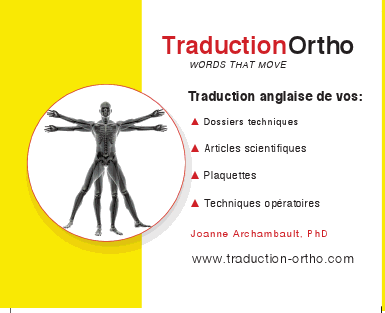 Joanne Archambault is a French to English translator based in New Hampshire; she grew up fully bilingual in Canada and then earned a PhD in biology and an MBA from universities in the U.S. After a 15 year career in the medical research industry, Joanne was ready for a career and lifestyle change and decided to explore translation. She initially focused on general medical translation, but soon found an untapped niche in the orthopedic implants industry–the people who make artificial knees, hips, etc. In just over three years, Joanne has developed a booming business as the go-to translator for her target clientele: French orthopedic and trauma surgeons and small to medium-sized orthopedic implant companies. I first met Joanne when she took my Getting Started as a Freelance Translator course a couple of years ago, and I recently interviewed her about her main marketing strategy: attending the annual convention and trade fair for orthopedic and trauma surgeons in France. This interview is fantastic if you’re looking to break into the direct client market using this type of strategy. Joanne describes exactly how she found and prepared for this conference, what she did while she was at the conference, and how she followed up with contacts afterward. As Joanne says in the interview, attending this one event (in 2010 and 2012) has taken her base of orthopedics-related direct clients from zero in 2010 to three in 2011 to twelve in 2012, with these clients now representing 45% of her total freelance income. I got a ton of new ideas from Joanne’s answers to my questions, so don’t miss this if you want to target direct clients by attending their industry conferences. Looking forward to hearing this! I am so inspired by this audio blog! Definitely some great ideas for moving forward with my freelance business. Thanks Stuart! Yes, I agree that regardless of one’s languages or specializations, there are opportunities like this for all of us! Great audio blog, Corinne, with lots of useful tips! Thanks Diana, glad you enjoyed it! Thanks for posting this interview! It’s very inspiring and contains lots of great pointers (especially the one about jotting down notes on the back of business cards for follow-ups). Joanne is very focused, driven and extremely well prepared! Potential clients are always going to be more interested if you’ve done your homework first, and she most certainly has! Thank you, glad you enjoyed the interview! I agree, Joanne’s work ethic and discipline are a major part of the equation: note where she says that instead of going out at night in Paris, she stays at the hotel and researches potential contacts for the next day! I really enjoyed this audio blog. Thank you Corinne and Joanne for sharing your ideas and posting the conversation. It is very inspiring and motivating.Many useful tips for sure! Thanks Diana! I agree, I learned a lot from Joanne’s tips too! This is a very inspiring success story. I am looking forward to start my course with you hoping to achieve the same success. Nice interview! Two things stuck in my mind: first, Joanne *has something to sell* — her attested expertise in orthopedics, built up through studies and work in her previous life. Among other things, this means she can chat with potential clients on an equal basis (and pass the Turing test). Second, while attending these industry events to build up her direct-client portfolio, she was also there to keep her specialist knowledge up to par. A great example of win-win. Is there any way to download the audio file? I usually listen to podcasts only when I am on the move. When I am actually sitting by the computer I am working and can’t spend half an hour just focusing on the interview. Thank you, Corinne, for posting this interview, and thank you, Joanne, for so graciously sharing your experience! This was of particular interest to me because I used a very similar approach recently when I attended a trade show in Bologna for the cosmetics and skincare industry. (I translate from Italian into English and have decided to specialize in this sector based on prior work experience in the field in Canada.) I also was a little shy about approaching people (especially because at a trade show they are there to sell, not to buy), but I had prepared a list of about 50 target clients beforehand, all of whom I researched in advance so that I wasn’t walking into conversations blind. As Joanne mentioned, it is very important to make notes on each meeting immediately afterwards! Jot down the name of the person you spoke with, how receptive they were, and what they said to you. It’s amazing how much of this you forget later, so your notes are essential for following up. Any little tidbit of conversation can be the basis for making a follow-up message personal and tailored instead of generic. Also, ask the person you speak with if they can give you the name of the person responsible for translations. Most people were happy to give me their colleagues’ business cards, or would give me their own if it turned out they were the ones who deal with exports or marketing. Knowing who to contact personally is so much better than sending a “To Whom it May Concern” email to info@youridealclient.com. I followed up with cards sent by snail mail to everyone who was kind enough to chat with me or to give me a business card – every contact whose actual name I was able to get my hands on, basically. I sent an email to everyone else saying that I had visited their stand at the show and provided a little bit of information about myself. And a month later, I’ve gotten a few replies telling me they will keep me in mind for the next translation they need. So fingers crossed! As Joanne says, to do something like this you need to be able to communicate quite well in person (and in writing) in your source language. In my humble opinion, making a mess of the language you are selling yourself as being a professional translator from can make a bad impression. We as translators know that you don’t need to speak or even necessarily write well in our source language to translate out of it, but I’m not sure that inspires much confidence in potential clients who don’t. If you feel good about your source-language communication, though, I think industry-specific trade shows/conferences are one of the best ways to find direct clients. Thanks! Those are all great points…food for another blog post! I really agree about writing down post-contact notes. When you get home and look at that pile of business cards, it’s so hard to even remember who the person was, much less what you were going to do to follow up with them. Thanks! Yes! I agree that this strategy takes a lot of courage, especially when you’re used to going to conferences where you know everyone, but Joanne’s results are pretty amazing! Thanks for posting this interview Corinne, and thanks to Joanne for sharing her experiences. I found it really encouraging to hear that Joanne has had success in such a very specialised field (not just medical translations generally, but orthopaedic translations specifically). Obviously this is how she achieves such great quality and is able to interact with direct clients as “one of them”. It’s easy to be scared of “over-specialising yourself out of the market” but this interview proves that need not be a concern. Thanks Caroline! Yes, I think it’s interesting that Joanne started out as a general medical translator, but now avoids general medical documents. Of course not all of us have a science PhD (I wish! ), but I think that you can transfer her example to many industries. Excellent interview. Very inspirational, even for old-hands like me 🙂 Thanks to both of you. Thank you; I do agree that no matter how long you’ve been in the business, there is still more to learn about marketing. Especially as people complain about “nosediving rates” from some companies, I think the answer is to look upward, so this interview gives some good food for thought. That’s really crackling with energy. I think inspirational is the right word here, too. I do wonder where you two get all your energy from, though. Keep up the good work! Thank you! We try! Personally I just drink a lot of coffee, I’m not sure about Joanne! @Jorge, I would rip it (while working on something else) and then transfer the mp3 file to a device to listen to it later. In fact, I will probably do that. Looking forward to listening to it! @Margaret S., thank you. I wonder why I didn’t think it myself. Cheers. I knew Joanne’s story, as I was her ATA mentor in 2010-2011. We were paired because we have a similar backgrounds – highly specialized second-career technical freelancer, etc. Isn’t she an amazing example! Great interview too, Corinne. When we started the mentoring relationship Joanne initially asked me to help her find direct clients but I knew she was way ahead of me and left me in the dust! We worked on a couple of other things instead. On the point you made about Joanne’s accent – I’m sure that’s true. I get that same all the time from Americans who want to hear my Scottish accent. Sometimes being different helps us to catch someone’s attention. On the point about working with small companies instead of multinationals, in the highly regulated business Joanne works in, medical devices, it is my experience that large companies will only subcontract to companies who have QA systems that fall in line with theirs (ISO certified, etc.). My direct clients in pharma and medical devices are also relatively small companies in France. I have entirely stopped trying to market myself directly to big pharma. In the US, those companies all appear to have contracts with large agencies. Thanks Karen! That’s fun that you were Joanne’s mentor (it must have been your great advice that made her so successful!!). It’s very funny that you mention the accent comment, because in the interview I almost said “I feel the same way about Karen Tkaczyk’s accent!) but I didn’t want to publicly announce that! And thanks for your point about small and medium-sized companies; I hadn’t thought about the ISO angle and I’m sure that you’re right. Excellent insight! Interesting that you contrast small and medium-size companies with large ones. While I agree that it can be easier to break into markets via SMEs (shorter line of command? ), my experience of very large French companies is different, at least for work in my field (finance and corporate communications). I am a newbie here on this blog, so first of all: hello everyone! I just came across this site. My situation is somewhat similar to that of Joanne’s: ready for a career and lifestyle change and exploring translation. I am having trouble in accessing this audio entry. Could it be that something is wrong with my browser (actually, I’ve tried opening tha audio file with two – Mozilla and IE,) , or is the audio file no longer accessible? Any information on how to access this precious interview would be much appreciated! 😉 – I was just exploring the web on various possibilities in contacting direct clients, and I daresay Joanne’s advice would help a lot here. Me too, the file is not working for me. Please reload or give us an alternative link. Thank you! Oh, it worked afterwards then stopped again. I guess the problem is with my Internet connection. I am a french into spanish translator specialized in cosmetics. I liked your interview to Joanne Archambault about how to search clients by going to the professional conferences they held frequently. I am considering going to a meeting of cosmetics that will be held in Paris next year in order to contact new clients. But I ask myself if it its worth to go there (I live in Colombia and the trip is expensive) instead of to continue looking for by internet the french cosmetics societies that could be my potential clients and sending them invitations to visit my web site. Could you give an advice regarding my doubt or may be ask a JOanna Archambault to give her point of view?